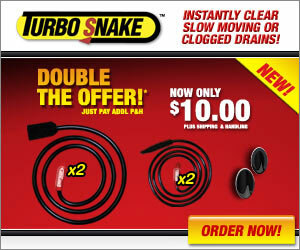 Turbo Snake is the easiest way to instantly clear slow moving or clogged drain. It clears any drain in 3 easy steps. Simply glide Turbo Snake down the drain, twirl, then pull out – Turbo Snake’s specially designed head grabs & locks onto hair clogs to remove and free the drain instantly! It’s that easy! What’s best, its flexible design easily maneuvers down the drain to seek out clogs without having to remove the drain stopper. For bathroom sinks, showers & tubs. Each set includes the Large Turbo Snake for Showers and Tubs, Small Turbo Snake for Sinks, and Peel and Stick Storage Hook.